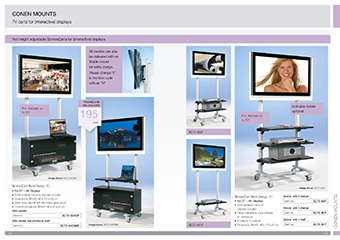 Our ScreenCart TV Rack has a sturdy steel construction that mounts the TV. A shelf provides enough space for your TV equipment. The base cabinet has 2 coloured glass doors. This means the TV devices can be controlled by remote, even if the tv rack doors are closed. The doors are lockable. The heavy-duty ScreenCart TV cart on wheels offers easy mobility even when using very heavy televisions thanks to the 4 wheels. To fix the TV rack in place, two of the rollers can be fixed. Rounded plastic legs with a stabilizing steel core made of 5 mm thick profile tube offer maximum stability. The steel tube frame of the TV cart with rack moves the balance point of the TV to the best possible safety position. TV rack for televisions up to 50"
Frame for all 27" - 50"